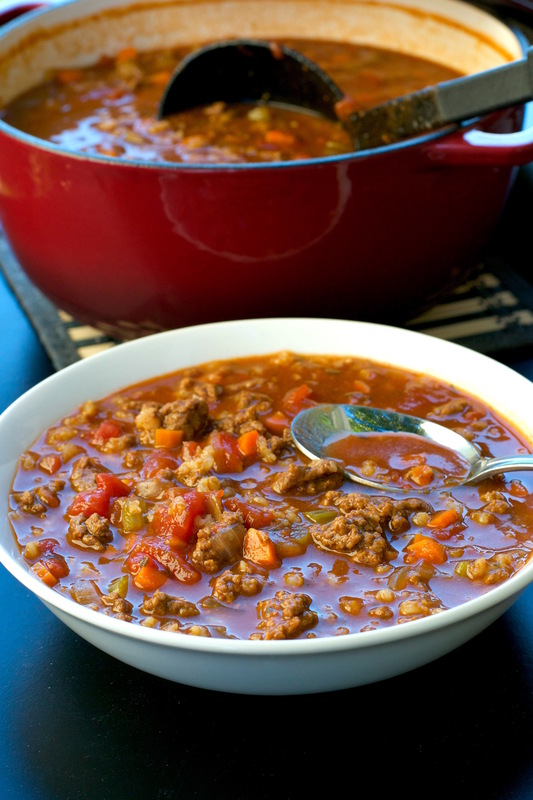 Hamburger Soup - What the Forks for Dinner? One of our first recipes on What the “Forks” for Dinner? was Hamburger Soup. It has been one of our most popular recipes and it is Tim and I’s personal favorite. Our picture taking skills were less than great when we first started, so we are happy to repost the recipe with new and improved pictures. 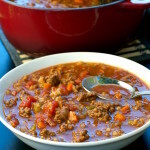 You can read the original post Hamburger Soup by clicking the link. 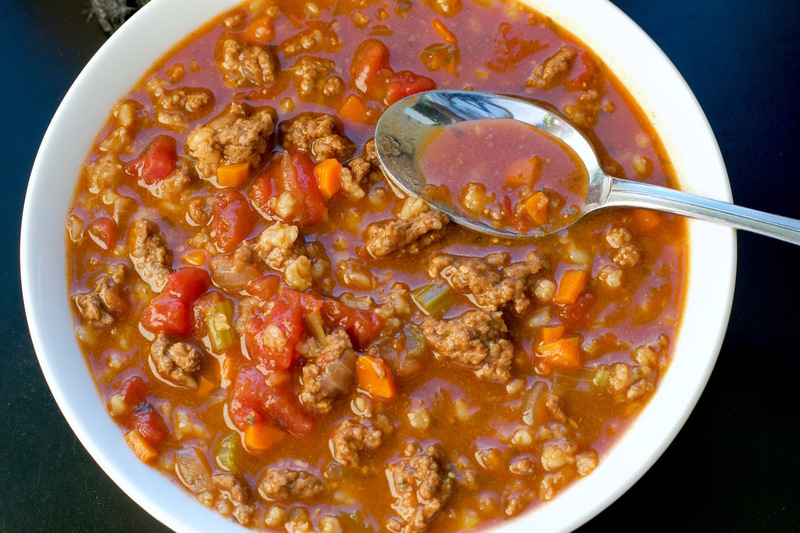 Please enjoy our update and try the Hamburger Soup……… we are sure it will be your new favorite!! 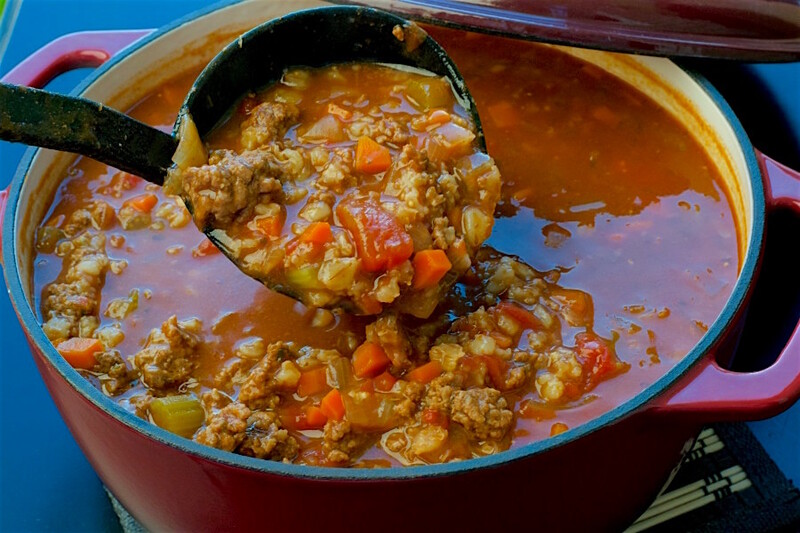 Heat a large soup pot over medium-high heat, and crumble in the ground beef. Cook and stir until the beef is evenly browned and no longer pink about 10 minutes. Beef base is a paste that is sold by the broths and bullion cubes at the grocery store. Do not use bullion cubes they will not work the same.It’s usually in a small jar. Please let us know what you think of the soup when you make it! Your soup looks delicious! Beef base has too much sodium for me to use. Can I make without? or Do you recommend a substitute? You can leave it out if you wish and use a low sodium beef broth without affecting the flavor. If you are using potatoes I would put them in with the rest of the vegetables. I think red potatoes would work fine. Hope you enjoy the soup. I use frozen cubed potatoes and add them when the carrots are about half cooked. I also add canned green beans and corn to make it a vegetable soup. You can also throw in any leftover veggies when the soup is almost done. My family loves it. This is Tim and I’s favorite soup recipe. So glad you and your family love it too! Instead of barley I use 1 cup of small white beans (add 3 quarts of water boil one minute then let soak 1 hour) and also add 1/4 cup uncooked rice. Our family favorite and can freeze leftovers if any left. What a great idea adding beans. Thanks for the idea. Thank you so much! This is our favortie soup!! Could this been done in the crockpot/slow cooker? If you browned the ground beef first absolutely Lindsay. Very tasty. Will make again and again but I believe there is a typo in the recipe…garlic pepper? I used garlic powder and no pepper. Delicious! Wendy….McCormicks makes a garlic pepper blend either in a grinder or shaker. I’ve seen a lot of recipes forhamburger soup that use shells or elbow macaroni. Would you recommend that? Hi! Just made this soup for dinner. Was delicious. I did add a little small elbow macaroni. Served it with fresh homemade sour dough bread. Also just because we love parmesan did sprinkle some on top. Thank you for this recipe. This is a no fail recipe! So glad you liked it Irene, It’s our very fav!!!!! Loved this recipe. No fail! Delicious.